NASA has stopped trying to restart the primary laser instrument on the ICESat spacecraft, and the seven-year ice-mapping mission has been declared complete, the agency announced Wednesday. Launched aboard a Delta 2 rocket on Jan. 12, 2003, the Ice, Cloud and land Elevation Satellite spent more than six years dutifully circling Earth, bouncing laser beams off the planet's surface to gauge the thickness of land and sea ice at high latitudes. The satellite measured the Earth's surface and atmosphere in "unprecedented 3-D detail," said Jay Zwally, the mission project scientist at NASA's Goddard Space Flight Center. ICESat was ultimately limited by the failure of its main instrument, the Geoscience Laser Altimeter System. The last of the GLAS payload's three lasers stopped emitting light on Oct. 11, and NASA has ceased attempts to restart the instrument, according to a statement. Produced at Goddard, GLAS monitored ice by firing laser pulses during observation campaigns lasting several weeks about three times per year. 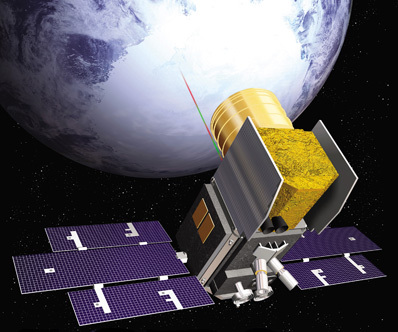 Since launch, the instrument completed 15 campaigns and its three lasers executed more than 1.9 billion laser pulses. GLAS accumulated about 15 months worth of data during the mission, NASA officials said. "ICESat has been an outstanding success, despite disappointing limitations in the laser lifetimes," Zwally said. "Scientific advances have been made in measuring changes in the mass of the Greenland and Antarctic ice sheets, polar sea ice thickness, vegetation-canopy heights, and the heights of clouds and aerosols." The satellite observed diminishing sea ice coverage in the Arctic Ocean and tracked glaciers in Greenland and Antarctica as they empty into the sea, according to NASA. "ICESat's loss is disappointing and it comes at a critical time," said Tom Wagner, the cryosphere program manager at NASA Headquarters. "But we can't lose sight of the fact that ICESat and its team of talented scientists and engineers helped us see the Earth's polar ice caps in a new way. Those observations are feeding a new generation of models to help us figure out where the planet is headed." ICESat was designed to operate for at least three years, with a five-year mission goal. NASA is planning a follow-on satellite named ICESat 2, but the new mission is not scheduled for launch until 2015. Operation Ice Bridge, an airborne survey of polar land and sea ice, will fill the gap between now and 2015. The European Space Agency is also planning to launch its own ice observation mission as early as next month.